There is a set of books that came through the Roman church called “Apocryphal Books”. These books contain mystical, hidden, sayings that are religious literature but they are not scripture. They have some religious history use among academia but have never been accepted as canonical or authoritative by Bible believers. The writings were supposedly done during the period between the Testaments, 400 B.C. to the First Century, A.D. They were seen as religious in nature but were not accepted as inspired. Literary education was quite advanced in the 1600’s compared to the 19th-21st centuries. 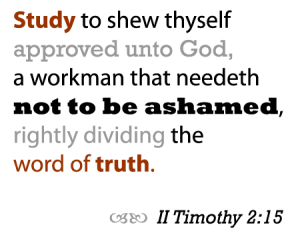 This is why they were included in the 1611 King James Version but at the same time were plainly set apart in their own section from the “Scriptures” of the Old and New Testaments in the 1611 edition. “Apocrypha” is the opposite of “Apocalypse”. Apocrypha means something that is concealed, not set forth, not authentic. Apocalypse means something revealed, disclosed, manifested, shown. The verb αποχαλυπτω means to reveal, to make manifest, to uncover to view. The noun αποχάλυψις means a revelation, a disclosure, an appearing, a making manifest. Sometimes one may see “Apocalypse” used in referring to the book of the Revelation. The revealing of the Lord Jesus Christ as “the Lion of the Tribe of Judah” and “The Lamb that taketh away the sin of the world” (Revelation 5:5) is the subject of the Book. The opening of the Book of Revelation is not what is meant in this first phrase. The Revelation is all about the Lord Jesus Christ, Whom He is and what He does.